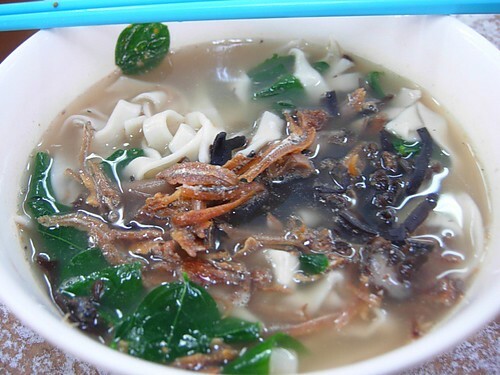 Is Pan Mee really from Sabah? Over here in Penang, we only have a few stalls selling Pan Mee and all of them usually call their stall Sabah Pan Meen. When I was in Sabah, I actually did not find a single stall selling Pan Mee. Then again, I didn’t go to that many hawker places so I cannot be sure. So, does anyone know if Pan Mee is really from Sabah or is it called that way because the noodle uses Sabah chai or sayur manis? Pan Mee is not noodle in pan but rather ‘pan’ means slab as in slab of thick slices of things? It is made of flour and hand torn into pieces. Very much like Italian pasta. The flour pieces are then boiled and served with a soup made of anchovies. Sabah vegetable, crispy fried anchovies and black fungus are used as garnishes. The above pan mee is from the Jalan Air Putih (off Jalan Air Itam) morning market. There are two coffee shops but I have forgotten which coffee shop it is. It is quite good and in fact, the only edible pan mee I can find around Penang. The soup is sweet and the noodle/pan mee very QQ. I don’t know it is it from Sabah but As far as I can remember, this recipe is from my grandma 🙂 and now in my kitchen. The handmade dough. I love making and eating it and yet when I eat out, I still order it. Yum yum! im from sabah,pure sabahan. its true that u’ll not find pan mee if u only in KK (kota kinabalu). but here in tawau i’ve once saw the menu @ my fav chinese restaurant here,but didnt hv a chance to try it coz the seller already moved. The way I understand it, its “Meen-Fun-Khou” from ages ago and at that time, they use their hands to pull and flatten the dough before putting it into the soup to cook. Later when they have those roller machine, they got lazy and use the machine since the dough coming out from the roller is thinner and more “standard size”…..which later they call it Pan Meen. There is one right in between the BJ flats which is sold only during lunch hours. It is usually packed with customers on weekdays. I think pan mee got famous as a hawker dish started from Tawau, Sabah. Remember the shop always pack with ppl. After a while the owner start opening branches of pan mee shop around Sabah. KK included. There some pan mee shop in KK but far from town center. Maybe that pan mee shop you see have the same owner as the one in Tawau. I am from KK , Sabah. You wont see much shop selling pan mee around town. but 1 shop which perhaps practically everyone knows around town is the Pan Mee shop at Gaya Street and a MUST try for those from outta town. Its the same row as Nan Xing restaurant. Cant miss it.Big Big bowl . Super yummy soup. I am from sabah but i would say this dish is a hakka dish instead, just like çº¢é¾Ÿæ£µ and ham choi-salted vege, where you can find in places if more hakka population resides. U can try 2 more stalls in Pg. One in Pulau Tikus @ Kong Bee Lee coffee shop (open in the morning).Another one in Macalister Road (corner coffee shop). The same shop is also well known for fried oyster, won-ton mee, char hor fun (prefer ta-pau in banana leaf) & bak-moy (stall is at the road side ). But I still prefer pan mee in KL. If u noticed, not many stalls are complete in their garnishing. The complete one should be with crispy fried achovives, minced meat, black fungus, chinese mushroom & mani-chai and fried shallots. I love eating my pan mee with chilly padi and sambal belacan. Well I certainly think that this is one of the healthiest hawker food besides assam laksa of course! Actually have been hunting high & low for the recipe and have bought the noodle maker months ago. yea there are alot of shops selling pan mee. even in wisma merdeka, a shopping complex in KK has it. too bad u didnt find it. dunno whr its frm. I dont know why it call “pan” mee when i was a kid. I use to make it together with my mom and granny. What we call is “dao ma chet” in hakka, which mean use knife to cut it become mee. like what RO said, dough coming out from the roller is thinner and easy to cut it to become mee. Hi, my name is Silas. I loved pan mien since i was a little kid. There are many speculations what Pan Mien is from Sabah as the Leafy Vege used in it is usually the Su Chai Choi (Sabah Vege) and is very difficult to find in the Peninsular as it only grows in Sabah. There are many Pan Mien Stalls and SHops in and around Kota Kinabalu actually if u looked closely and know where to find them. 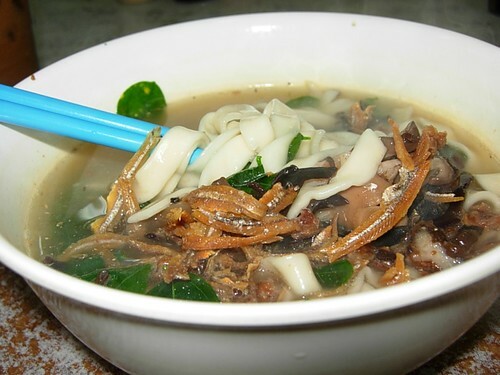 However, this type of noodles i believe did not originate from Sabah as even the Koreans have a similar type of dish. Only that they are also available in Seafood as well. If u happen to be wondering how this looks like, you can visit my stall which will be opening in Mid June 2010 in Food City food court located in Kolombong area of Kota Kinabalu. Pan Mee is always a treat especially with lots of chillies 😀 yummy!! !